Chevy Colorado & GMC Canyon > 2nd Generation Chevrolet Colorado and GMC Canyon > 2nd Gen Engines and Technical Discussion > Do you have black oil? Ive been hesitating posting this question. I either feel its a dumb question, or I'm afraid of the answer. Is your used oil totally black, or amber , or somewhere in between? If you do have relatively clear oil, what oil and filter is used? I ask this because I thought the newer engines were cleaner and the oils came out cleaner. But I have had black-as-coal oil since change one. Even when I was doing 500 mile break in changes. The Blackstone oil reports have been stellar so far, even though I don't use ultra high filtration sub-micron filters. I use Mobil1 full syn Dexos1 5w-30 and K&N filters. Is the K&N not filtering out the blackness? I wouldn't expect it to. Its high flow, not high filtration. A trade-off Im willing to take. I have a lot of paranoia riding on this so please be honest! The blackness probably isn't doing any harm at all so i don't know what Im worried about. Unless the PCV isn't working. Gawd knows Ive mucked around with it enuf. 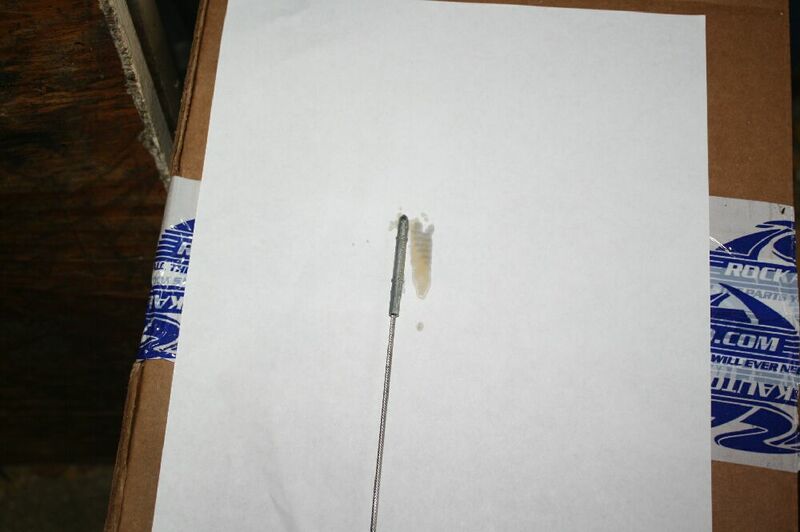 i dont have black oil,is your k&n filter accordable with synthetic oil ? Dark oil color in itself isn't actually a problem. You said so yourself; the blackstone reports are coming back stellar. Why don't you trust the 3rd-party professionals with the science lab who know lubricants? 16WhiteColly, MV10, Iamscotticus and 1 others like this. Slower than a herd of turtles in peanut butter! Last edited by DFlorida; 04-14-2019 at 01:28 AM. ti-claude31 and Iamscotticus like this. As engine oil gets darker, it can indicate a) high heat, b) contaminants, or c) the presence of additives that cause the oil to darken during normal use. Therefore, the best way to determine what color your oil should be is to observe how your oil changes color over time. Just pull the dipstick every few days, make a mental note, and at some point you’ll learn to “read” your engine’s oil by color, i.e. you may find that your oil starts to look dark brown after 3,000 miles, and very dark brown after 5,000. 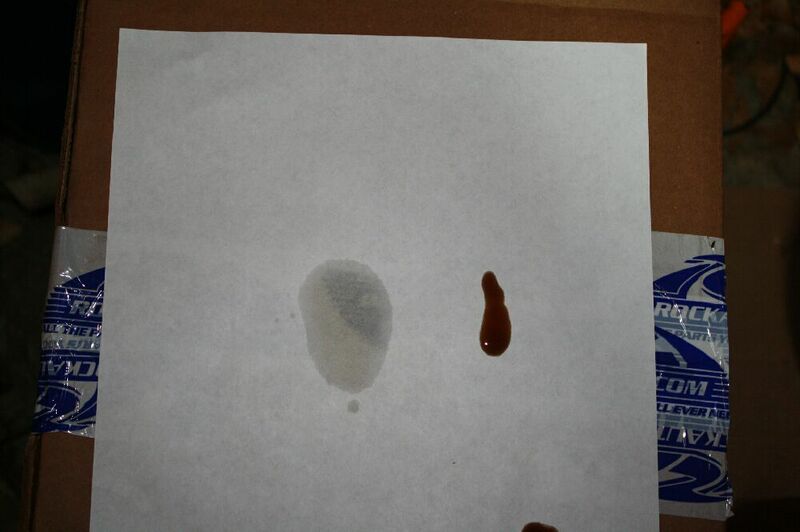 If your oil is supposed to be changed every 5,000 miles, than you know that “very dark brown” likely means it’s time. Of course, if you change oil brands or types, all bets are off. Weather can effect color too (to a lesser degree), so diagnosing oil by color is never going to be an exact science. Milky, foamy, and/or cream-colored oil can be indicative of a head gasket leak, especially if you’re seeing white smoke in your exhaust and your vehicle is losing coolant. Thick AND dark oil usually indicates dirt or contaminants. If you’ve gone off-road and exposed your engine to a lot of dust (for example), your thick and dark oil probably means it’s time for an oil change. Oil with a creamy, frothy texture can also indicate water contamination, so if you are NOT seeing white smoke and low coolant levels (or contaminated coolant) in your vehicle, than water would be the next likely source of contamination. Oil color won’t generally be effected by gasoline contamination, but oil smell will change quite a bit, as the oil will smell much like gasoline. Therefore, you don’t need to look at the oil to check for fuel contaminants, you need to smell it. Iamscotticus and Dmross11 like this. You should join BITOG - https://www.bobistheoilguy.com, if you're not already a member. Oil, oil filters, flow rates, etc. are discussed ad nauseam. Suffice it to say that you will never push the flow limits of any of the modern oil filters, but some have much better filtration than K&N. The use of non leaded gas is causing oil to turn blackish, checkyour tailpipe the cold is different now then we had leaded fuel! Don’t worry your oil is fine. If that was true we all would have BLACK Oil ! My Oil is NOT Black . IS Your oil black ? Last edited by DFlorida; 04-14-2019 at 06:50 PM. Scott, why have you decided to use K&N filters over AC Delco? Just wondering. Have the AC Delco filters proven to be a problem? Toughsox and Iamscotticus like this. A little tab of oil isnt going to be black unless its been run a long time. You need more volume to see the true color. Changed out my oil last weekend if the second me free oil from dealer. It was black coming out of the pan. I didnt ha e a light on it so theres that. At your next change, drain the oil from the pan into a clear tubberware. Its just a warm fuzzy I get of thinking that the bypasses may not be opening as much. How much bypass happens during cold start up and acceleration? Maybe none, maybe more than we know. But with oil pumps and lines blowing in Canada, I was happy to have the K&N in there when its cold down here "ON" Antartica, because no one can be "IN" Antartica. Yes. The pleats have never crushed or deformed. “ checkyour tailpipe the cold is different now then we had leaded fuel”. Someone is dating his/her self! V-6 with convenience and towing packages. Added Factory recovery loops (used), factory fog lights (used), tinted front windows, 5" stainless curved nerf bars, tri-fold tonneau cover, bed mat, mud flaps and gel seat cushions. Really i don't need to put 6 quarts oil in a clear Tupperware (Not Tubberware) to see if it's BLACK or Darker (Brown) if you can't see that small oil drop on right is darker then you need Glasses or do you need a pan full of 6 quarts of oil in a clear Tupperware to see its darker ???? 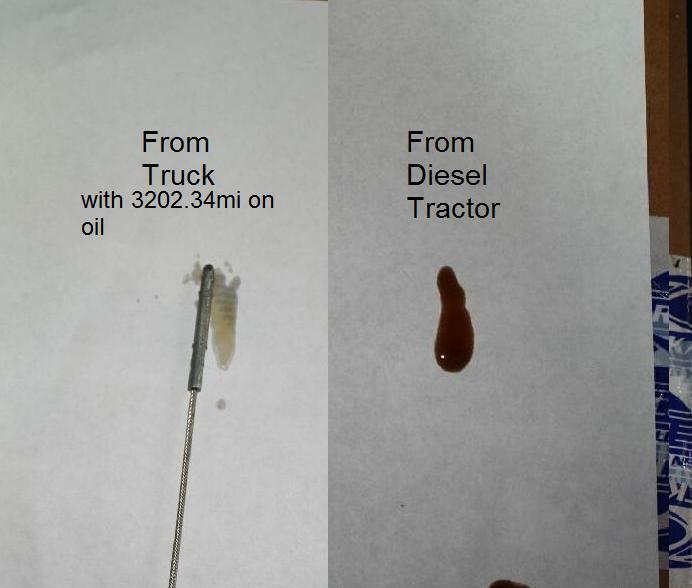 That oil drop on right is from my Diesel Tractor & you can clearly see its Brown but NOT BLACK , Wow wait I forgot you can't because you need a Clear Tupperware Pan Full of oil before you can tell if its Clear or Darker or Black! MY oil has never been Black-AS-Coal in any of my Vehicles, that oil from my Colorado has over 3000miles on it and its still Clear & Dmross11: says he has 4800 miles on his oil and its still amber , If you like Black as Coal oil more Power to ya . Last edited by DFlorida; 04-15-2019 at 10:40 PM. You must be a blast to be around with.